Ellie Holcomb sings these lines in her song titled Marvelous Light–– then you gave my heart a home / so I walked out of the darkness and into the light. Every time I hear them I think about lots of things but they even, oddly enough, draw me into thinking about the transformation of our house into a home. Today, I wanted to share one more piece of our home with you. They say that looking back and seeing your starting place, measuring it up to where you've journeyed to, can be very encouraging. And, I am indeed here to say that, yes!, I'm encouraged. 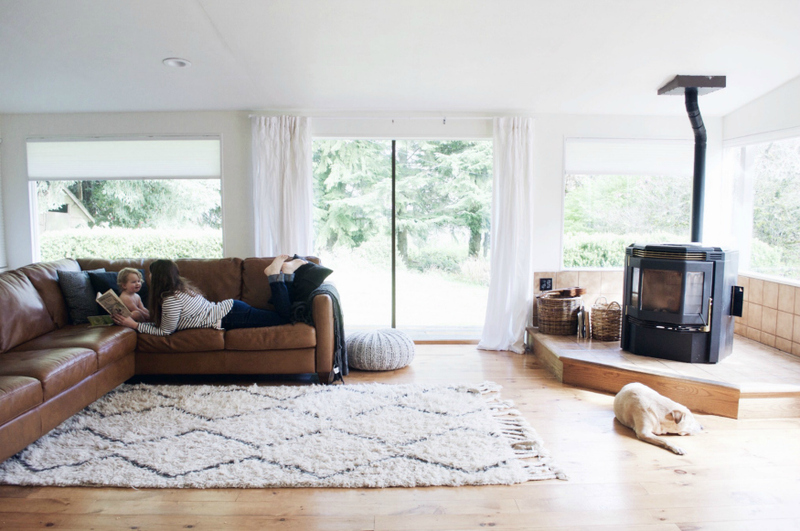 When we purchased our home a little over a year ago, we immediately fell in love with what we now call our sunroom, even with its dark demeanor, water-damaged paneling, dingy ceiling tiles, and, don't miss this–– red and blue blinds. Somehow, through all of that, it still spoke to us and we knew that by a slow and steady transformation it would become our most loved and used space. And we were right. One of the first decisions that we made concerning this space was to tear out the existing carpet and install pine flooring. Next, we decided to drywall the ceiling and walls. ( Although our original plan did not include spending part of our budget on drywall, extensive water damage made that decision for us. ) This past November, while here visiting, my dear dad purchased and then installed new trim around every door and window. ( love you, dad and mom! ) The new trim made such an immediately visible difference in this room, especially after it was painted. During Christmas break, we buckled our three little ones into the van and took a field-trip to a wood shop. My husband's grandma had sent a cash gift for Christmas and we decided to use it to build an eight-foot long work space. We chose two large cuts of maple and on New Year's Eve my husband built my design and we've been enjoying it ever since. I love that nearly every time I sit down to use it I think of my husband's grandma. ( I designed this desk for two purposes: to give us plenty of work space and, most importantly, to hide ALL THE CORDS. All the OCD smiles over here. ) This work space is plenty large to support the boys and I and is often crammed full of Lego creations all.day.long. I love it. For months I imagined an oversized cork board hanging above this desk. I scoured thrift shops for the perfectly sized board but came up empty-handed. Then, as I was browsing the aisles of Home Depot, I came across a 4'x6' piece of concrete rebar mesh. It was perfect. A few days later, we picked it up on our valentine's day date and laughed as we tossed it carefully into the van –– it was the best seven dollar valentine's day gift ever! In early January, I worked with Josh and Abigail at Blinds.com to configure shades for the windows. This was a nerve-racking decision for me. I desperately wanted to get it right and leaned towards simple white shades but feared the room would lack character. I worried that my Graeme-bear would be sad at the sight of more white! ( I'm still trying to convince him that white is actually a color. In his defense, there's a lot of white! And, to put things in perspective, you have to bear in mind that four out of six windows in this room measure over five feet wide, not to mention three sets of sliding glass doors. ) 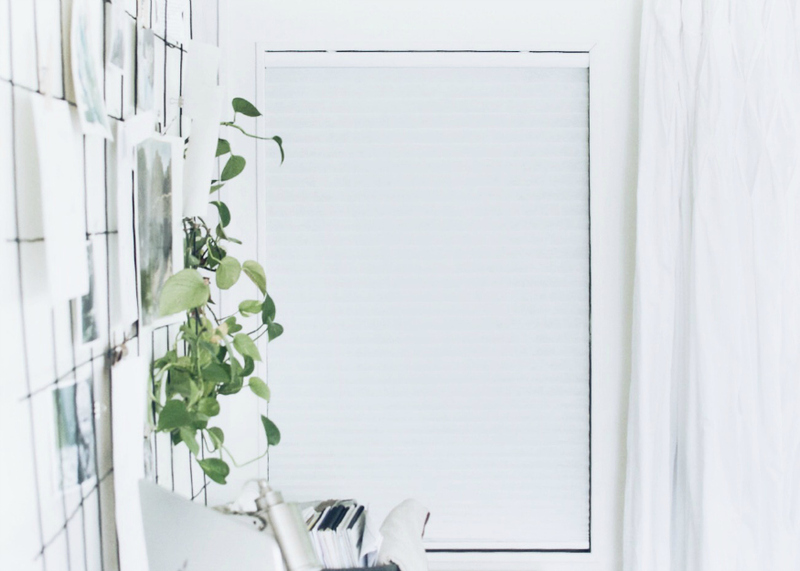 I settled on their Light Filtering Cellular Shades in Glacier White and when they arrived I knew, thank goodness!, they were the perfect fit for us. 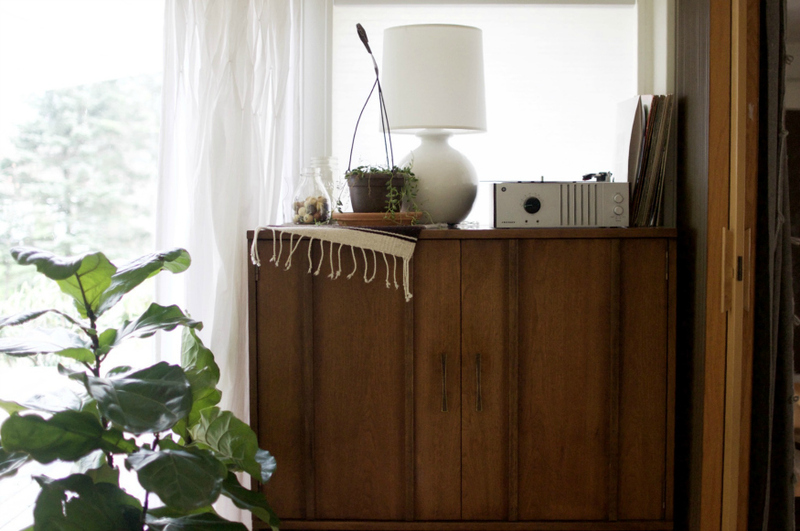 After nearly a year of living in our new home, our sunroom renovation was coming to a close. Finally, we could close up this room at night, we could cover the view of the gigantic hot tub directly out the window, we could feel at home in our own space. 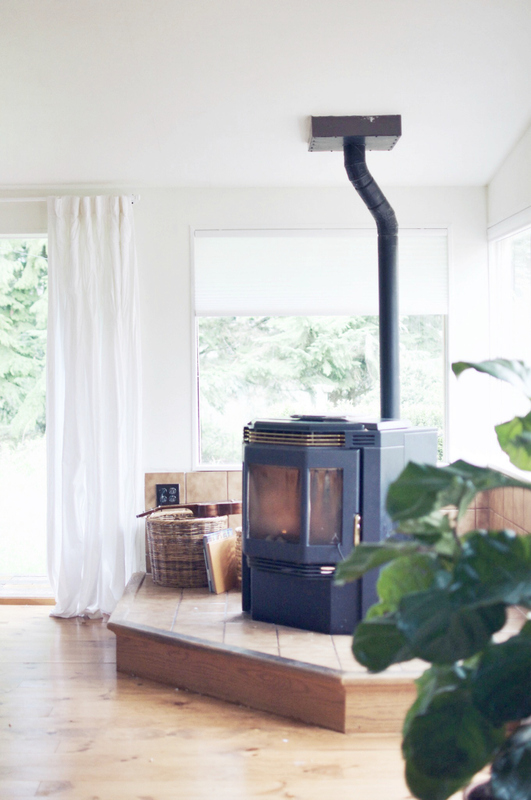 It's fair to say that our sunroom is our happy place. 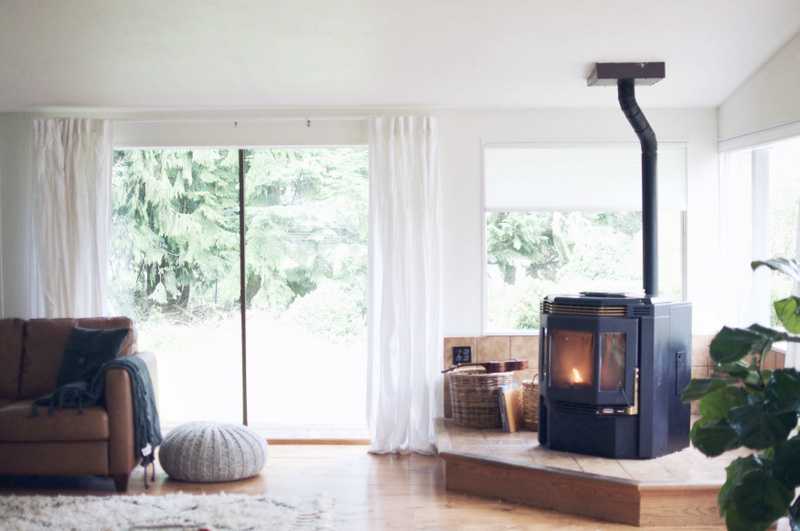 Filled with bright light, a large workspace, family photographs and special notes, and a cozy stove, it cheers us up even on the dreariest days. I was chatting back and forth with Abigail the other day and I told her –– thank you so much for making our house a home. And I mean it. We are very grateful to have worked with Blinds.com over the last year ( see our living room shutters here and our bedroom shutters here) and we do not take these gifts from both family and Blinds.com for granted. You know what they say–– anything worth having is worth waiting for? This space, this feeling of completeness, it was worth waiting for. It feels so good to call it home. p.s. Here's a short and fun(ny) video we made for Blinds.com about the installation. Oh what fun it is to hang window coverings with three busy little ones. . .
Blinds.com Installation from Sarah Kate Branine on Vimeo. lovely! 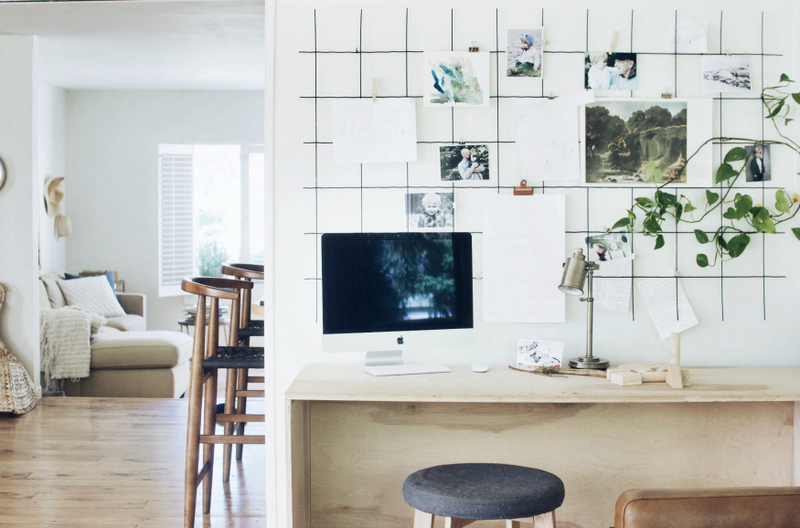 it is such fun to get peeks in your space and fresh inspiration -- those blinds are the perfect choice. I love how they let in light! Wonderful !! Love it so much !! Here it is - many months after you have posted this - and we're about to choose new blinds for our kitchen. And in the back of my mind I remembered this on your blog! Yea! So helpful - thank you!! ruou sam dùng để ngâm với nhân sâm là thuộc loại ruou sam han quoc ngon, thượng hạng đảm bảo chất lượng tốt nhất cho người dùng. rượu sâm được người dùng tin tưởng sử dụng và thường lựa chọn để trưng bày sẽ làm cho không gian trở nên sang trọng hơn, rượu nhân sâm​ không chỉ có ý nghĩa đối với sức khỏe mà còn đem đến nhiều ý nghĩa khác. Người ta quan niệm rằng, nếu trưng bày rượu sâm hàn quốc trong phòng khách sẽ mang tới sức khỏe, tài lộc và phú quý. ruou nhan sam thực sự là món quà tặng độc đáo và ý nghĩa phù hợp với tất cả mọi người. nam linh chi han quoc có tên khoa học là Ganoderma lucidum, thuộc họ nấm linh. nam linh chi là từ lâu đã được xem là vị thuốc quý từ thiên nhiên trong việc bồi bổ sức khỏe và hỗ trợ chữa bệnh. nam linh chi do thuộc họ nấm lim, còn có tên khác như Tiên thảo, Nấm trường thọ, Vạn niên nhung. Trong "Thần nông bản thảo" người ta xếp gia nam linh chi vào loại thượng phẩm tốt hơn cả nhân sâm. شركة مكافحة النمل الابيض بالرياض https://wp.me/Pa9yzo-f5 أفضل وأسهل الطرق التي تساعدهم في كيفية التخلص من الحشرات المزعجة وعلى رأسهم حشرة النمل الأبيض، من المعروف أن مكافحة الحشرة بالمبيد الحشري ليسهل عليكِ، يقوم فريق العمل به بكل سهولة كما يعتقد الكثير من الأشخاص، فلا يضرك الكثير أن الاستخدام الخاطئ للمبيد، قد ينتج عنه إصابة الإنسان بالعديد من الأمراض الوخيمة. شركة تنظيف خزانات بالرياض https://wp.me/Pa9yzo-8s ان عملية تنظيف الخزانات بالرياض تحتاج الى مهندسين متخصصين فى مجال التنظيف الخاص بالمياه حيث أن المياه تعتبر من الأمور الهامة التى تتعلق بالأسرة كلها حيث أنها مورد يصل الى كل فرد من أفراد الأسرة لذلك عميلنا العزيز عليك بالأهتمام بها .